In 2007 when I was in Jerusalem I received a prophecy through the charismatic gift of prophecy that the United States of America would split but one day be restored as part of a Catholic Monarchy during the Era of Peace. Recently on the Catholic website 'Spiritdaily' was mentioned a prophetic impression given to a Carmelite about the future of America in the coming Era of Peace: "..."I recently had an experience that I wouldn’t call a vision, but more like an inner impression, that lasted about two seconds, of what America will be like in the 'era of Peace,'" wrote a third-order Carmelite from Long Island. "It surprised me the amount of information I absorbed in that short period of time. It was impressed upon me that America still existed from coast to coast, meaning from the Atlantic to the Pacific, but great geographic changes had occurred. The changes were brought about primarily through natural disasters (earthquakes, floods), but I can’t tell you where in the country it happened – I just knew that it was necessary for purification and renewal. The social order was completely Christian, and the country was no longer a Republic, but more like a Kingdom. Black Americans had their own separate nation-state in the southeast of the country – separate, independent, but a part of the commonwealth of nation-states within the American Kingdom. American Indians also had a separate nation-state in the west. Now I know that the Black and Indian people live across the entire country, but for some reason my attention was drawn to the Southeast and West. Both peoples had requested self-determination, and in justice, it was granted to them, but both remained a part of the whole. I don’t know why the focus was on these two peoples, but my sense was that we could not have harmony until there was a 'balancing of the scales,' and I can only assume that the rest of the people were living together in what remained of the country in other nation-states but the specifics were not revealed. Overall the society was in the main agricultural, and prosperous, and peaceful. The feeling was that all was well."..." 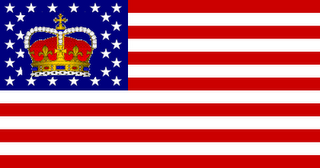 As a citizen of the Commonwealth of Australia which is still a constitutional monarchy, the mention of an American Commonwealth under the Crown was of particular interest. As the future King of the Commonwealth of Australia prepares for his Wedding I am pleased to think that one day he may also be the King of the Commonwealth of America, while his brother becomes the Great Monarch Henry the Lion of Europe. We now await the revolution and civil war in England in which the monarchy is abolished, the king assassinated and the surviving Royals in Exile from England.